Master bedrooms should be quiet, calm, cozy and just yours. There should not be kids in your bed and pets on your pillows... We all work very hard, we all deserve the serenity in those rooms. Bed-rooms should be decorated in such way that everyone who uses them feels at ease there, and can easily unwind, fall a sleep and rest. One of the main aspects of room's decorating scheme, is of course comfort. Many prefer the softness of a good quality carpet over the hard surface of a hardwood floor. They like walking barefoot and enjoy the luxury feeling beneath their feet. Carpet provides not only comfort of softness but also the feeling of warmth. Warmth is so important to us, here in Ontario, our winters are quite long and cold. We seek the shelter of our bed-rooms to regenerate for the day ahead. The comfort and warmth are very important. With all that in mind, we look toward the rainbow of colors available to us through the retailers. Then we consider our lifestyle and really look into the maintenance of a quality carpet... And the spectacular carpeted vision of our master bed-room fades away. Everyone is different and vacuuming a carpet can be a blast for some, but for others it could be a dreaded chore. You have to decide for yourself which group you belong to. If you don't mind to vacuum several times a week and to shampoo twice a year, go ahead and have fun choosing your new carpet for your bedroom. 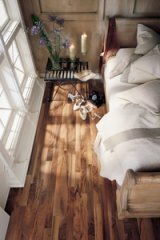 If carpet vacuuming is not something that you love to do, and you wish it could be easier to have a little luxury in your bed-room, take a closer look at today's hardwood flooring choices. They do lack in softness, but their look can be indeed warm and splendid. Not only hardwood floor is easier to maintain and fun to vacuum - no need for the heavy electrical brushes... it will also substantially upgrade the value of your home. There is one more aspect that may convince you to choose a smooth hardwood flooring over the spectacular carpet, especially if you or any member of your family suffers from respiratory illness. With hardwood floor in your home, the amount of air borne pollutants is drastically reduced. This fact alone will reduce the danger of asthma attack, and respiratory illness episodes.